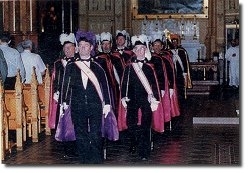 The Knights of Columbus is the world's largest Catholic family fraternal service organization with 1.6 million members. It provides members and their families with volunteer opportunities in service to the Catholic Church, their communities, families and young people. As a member of the Knights of Columbus you and your family enjoy many benefits, including 12 free issues annually of the Columbia magazine, the world's largest Catholic family magazine, eligibility to join the Knights of Columbus top-ranked life insurance program, and many more family and personal benefits. As a member of the Knights of Columbus you can meet new friends and become involved in Church Activities, Youth Activities, Family Activities, Community Service and Council Activities. For more information about the Ladies Auxiliary contact Diana Moll (President of Auxiliary) at 314-892-8572 or email at: dianamoll@yahoo.com.